Here's How You Can Add One Of Nature's Most Beneficial Superfoods To Your Daily Diet! Did you know that turmeric powder can protect your body from inflammation, reduce joint pain and promote mental clarity, focus and concentration? But finding pure, organic and flavorful ground turmeric can be difficult. Until now! Introducing The Cha's Organics Fair Trade Organic Turmeric Curcumin Powder! Once considered the spice of kings, turmeric powder can add a tropical twist to your favorite recipes while supporting a stronger immune system, combating inflammation and promoting improved cognitive function! 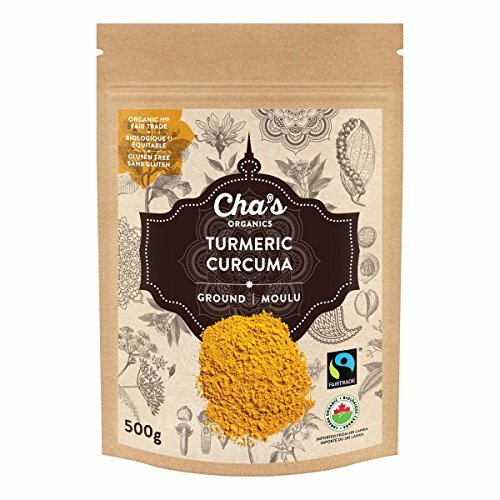 Why Choose The Cha's Organics Fresh Ground Curcumin? • Add A Golden Spice To Your Dishes - if you want to cook the most mouth-watering and healthiest curries, noodles, vegetables, soups, stews or even smoothies, our organic turmeric ground is exactly what you need! • Perfect For Your Taste Buds & Your Body - our fragrant curcumin powder is rich in phytonutrients, which reinforce your immune system and act as powerful anti-inflammatory agents, thus boosting your overall health and wellbeing! • Fair Trade & 100% Organic - while other turmeric powders contains artificial additives and flavor enhancers, our pure curcumin ground is grown by small-scales producers using only traditional methods and the golden rhizomes are harvested and sun-dried exclusively in Sri Lanka! Turmeric, or Curcuma Longa, has been used as a natural superfood for centuries and now you and your family can enjoy the purest form of turmeric, with Cha's Organics premium turmeric powder! Click "Add To Cart" NOW & Discover The True Flavor & Aroma Of Pure Turmeric! STRAIGHT FROM THE GREEN HILLS OF SRI LANKA TO YOUR DINNER TABLE! Our certified organic turmeric powder is here to add an exotic twist to your favorite recipes and help you boost your immune system! The Cha's Organics delicious ground curcumin will enhance the flavor of your favorite dishes and impress everyone! DISCOVER THE IMMENSE HEALTH BENEFITS OF OUR PURE TURMERIC powder, which is organically grown by small-scale farmers amongst lush forest gardens in Sri Lanka! Our ground turmeric is rich in curcuminoids, which are active compounds that help bolster your immunity and promote focus and mental clarity. ENJOY THE MOST FRAGRANT & MOUTH-WATERING TURMERIC and take your favorite dishes to a whole other level! You can add this anti-inflammatory spice to your rice, egg scrambles, soups, sautéed vegetables, smoothies or even make a cup of invigorating curcumin tea! UNLIKE OTHER LOW-QUALITY CURCUMIN POWDERS, our organic and fair trade ground turmeric root contains NO artificial additives, NO flavor enhancer, NO pesticides, NO chemicals and NO added ingredients. What you get is the purest, freshest and most flavorful Sri Lankan turmeric powder! ADD ONE OF NATURE'S MOST POWERFUL SUPERFOODS TO YOUR DISHES! Turmeric has been known to boost your immune system, turbocharge your metabolism and help your body in multiple ways. And Cha's Organics turmeric powder is the purest, rawest and most delicious way to enjoy this natural superfood! If you have any questions about this product by Cha's Organics, contact us by completing and submitting the form below. If you are looking for a specif part number, please include it with your message.